End-to-end IIOT solutions showcase how to turn sensor data into actionable insights. When this sensor data is paired with industry leading analytics platforms, it takes customer intelligence and operational efficiency to the next level. ADLINK Technology, a global provider of leading edge computing solutions that drive data-to-decision applications across industries, will present integrated demonstrations showing how customers can collect, store and analyze data with Industrial Internet of Things (IIoT) gateways to improve operational efficiency. The demonstrations will take place in Booth 124 at IoT World 2017, May 16 – May 18, at the Santa Clara Convention Center. The Vortex Edge PMQ solution features IBM’s Predictive Maintenance and Quality (PMQ) analytics platform and ADLINK MXE series IIoT Gateways. A conveyor belt and electric motor equipped with multiple sensors pushes real-time data through an ADLINK MXE-200 IIoT gateway highlights how predictive analytics and edge computing can enable advanced machine-monitoring on the factory floor. The Vortex Edge PMQ reduces asset downtime, improves production quality and increases equipment longevity. Vortex Edge PMQ provides a fully integrated hardware, data connectivity, and analytics package that transforms Industrial IoT data into insights and actions. OSIsoft’s PI System for Edge Gateways demonstrates how ADLINK’s MXE-200 ruggedized IIoT gateway can be used for remote asset management. The demo collects, stores and delivers sensor data on the network edge in mission-critical environments while running OSIsoft’s PI system for Edge Gateways. The system provides real-time and optimized remote asset management for greater profitability and operational excellence. 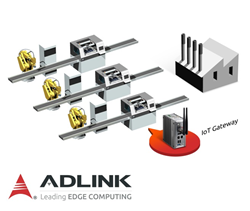 Learn more about ADLINK’s IIoT Solutions click here. ADLINK Technology is leading edge computing with solutions that drive data-to-decision applications across industries. ADLINK offers building blocks and market-specific IIoT platforms to serve the automation, communications, medical, transportation, and defense/government verticals. Many products are Extreme Rugged™, supporting extended temperatures, shock and vibration. ADLINK is a Premier Member of the Intel® Internet of Things Solutions Alliance and is active in several standards organizations and interoperability initiatives.